On Saturday afternoon, Martin Luther King III looked out over rows of chairs in Old Cabell Hall that, 55 years ago, were filled with more than 900 University of Virginia students and faculty members listening to his father, Dr. Martin Luther King Jr.
King, the eldest son of the revered civil rights activist and Coretta Scott King, was in town for the premiere of “Charlottesville,” a new documentary created by UVA’s Center for Politics and Community Idea Stations about the violent white supremacist demonstrations at UVA and in Charlottesville in August 2017. He called the documentary “extremely moving,” and expressed hope that it would spur important discussions around the country. King joined Center for Politics director Larry Sabato for a post-screening discussion in the Paramount Theatre Saturday night as part of the 31st annual Virginia Film Festival, featuring more than 150 film screenings around UVA and Charlottesville over the weekend. The festival is a program of the University, its Office of the Executive Vice President and Provost and the vice provost for the arts. The “Charlottesville” screening was also sponsored by the Frank Batten School of Leadership and Public Policy. Beforehand, King, who has followed in his father’s footsteps as a human rights activist, took time to retrace some of those steps at UVA and speak to the media in Old Cabell Hall. The elder King came to UVA on March 25, 1963, at the invitation of a small group of students. Those students, many of them African-Americans, were concerned by persecution and discrimination on Grounds and started a group, the Thomas Jefferson Virginia Council on Human Relations, as a platform to address social injustice. They invited King to help their cause. He accepted, drove himself up from Georgia and spoke for about an hour to a full house, making a case against racial segregation at universities and calling for increased enrollment of African-American students at southern colleges and universities. Wesley Harris, one of the students who brought King to Grounds in 1963 and had dinner with him that day, recounted the visit for UVA Today earlier this year. He said the late civil rights leader’s demeanor made a lasting impression on him. 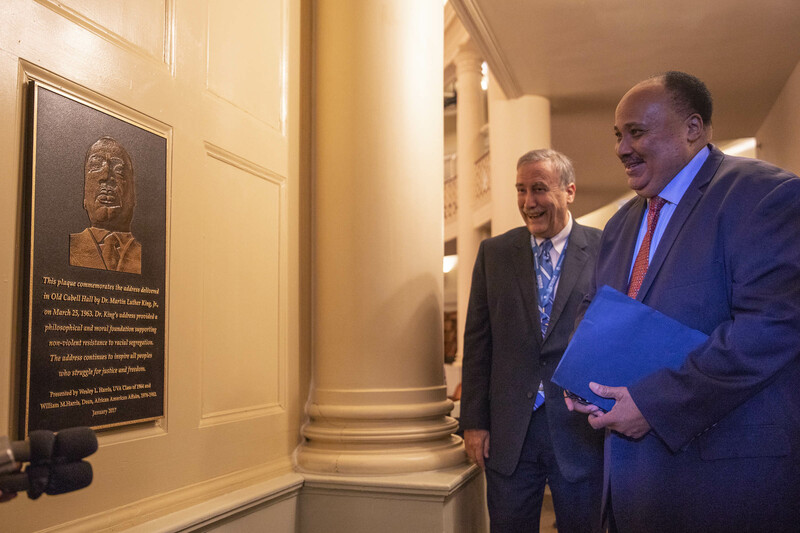 On Saturday, Martin Luther King III, who was 10 years old when his father was assassinated, recalled some of those words and reiterated his father’s well-known emphasis on nonviolence, even in the face of great injustice. He acknowledged that, despite gains made by his father and others who followed him, events like the demonstrations in Charlottesville show that their work is far from over. “We are seeing right now that we still have work to do,” he said. However, like his father, he expressed hope for the future, citing the activism of high school students after school shootings this year, the possibility of high voter turnout in Tuesday’s midterm elections, and the necessity of finding some area of agreement between America’s two parties, even when that feels like a very tall order.